Can I just tell you I hate driving in a city. It was almost a disaster for me as I almost got in a car accident trying to find my hotel. I was in the wrong lane so at the last minute I attempted to change lanes (often done in city, right). Since it was the weekend, there wasn't a lot of traffic so people were driving much faster than the speed limit. Before I committed to my lane change, I checked my rearview mirror to see a VW coming up at high speed. I stopped where I was. Lots of room for her to get by on my right but she still layed on the horn and screached to an almost stop and shot me a snotty look. So that's how it started. After locating my hotel, but it being too early to check-in, I headed to the Inner Harbor. I went to check out Federal Hill which is on the other side of the Harbor, a view I've not really seen before. 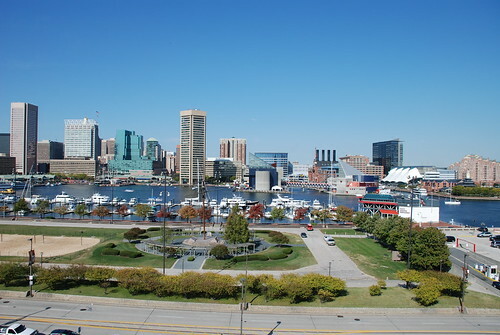 Federal Hill was discovered by Captain John Smith in 1608 on his first exploration of the Chesapeake Bay. It earned its name in 1788, when thousands of Baltimoreans marched from Fells Point to the hill in celebration of the Maryland General Assembly's ratification of the Constitution. (Residents of the neighborhood reenacted the parade 200 years later.) Subsequently it was the scene of other civic celebrations. Shortly after Independence, an observatory was erected on the hill so merchants could get advance warning of the arrival of their vessels. 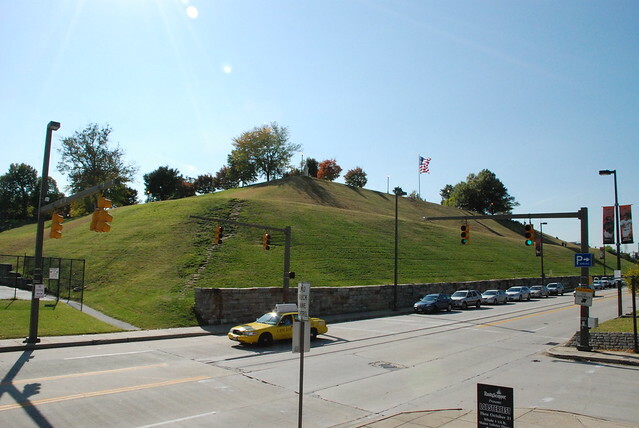 The hill gained notoriety during the Civil War. 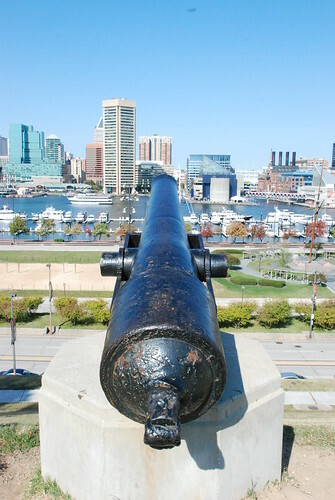 Federal troops occupied the hill and trained their cannon on the city, whose loyalty to the North was in some doubt. The city government acquired the hill in 1875 and made it a park. The marine observatory was discontinued in 1899. For much of the 19th century the Federal Hill shore shared with Fells Point the city's thriving shipping trade and related industries. Federal Hill itself was mined for sand for a nearby glassworks, leaving behind some caverns which exist to this day and are a favorite subject of legends. 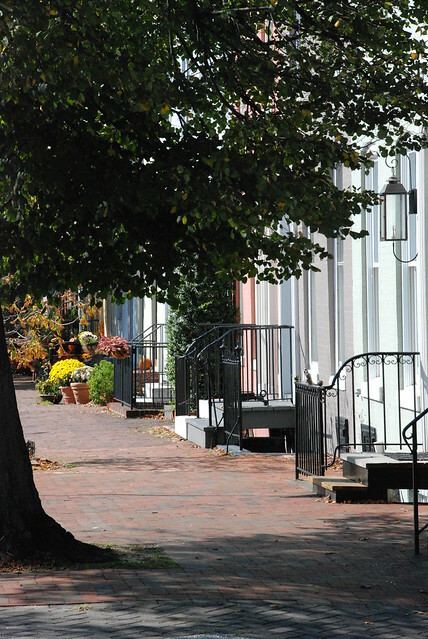 Modern Federal Hill was born around 1960, when a few hardy pioneers bought and began renovating homes in what had become a dowdy neighborhood. 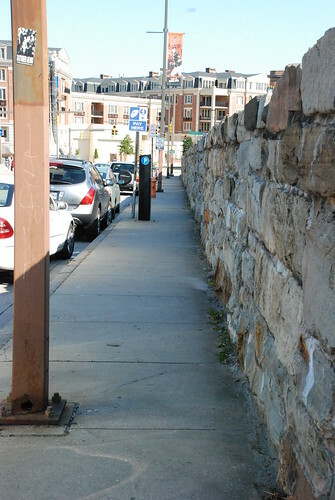 But the existence of the neighborhood was threatened in the mid-60's by a plan to plow through it with an interstate highway, part of a complex of connecting freeways that would have demolished the Inner Harbor and Fells Point. The residents rebelled, joined hands across the harbor, and eventually defeated the plan. 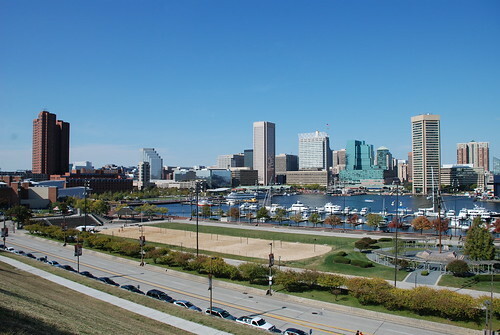 The rebuilding of the Inner Harbor area in the late 70s and early 80s greatly increased interest in Federal Hill as an enclave of intimate residential streets within minutes of the city's business and entertainment heart. 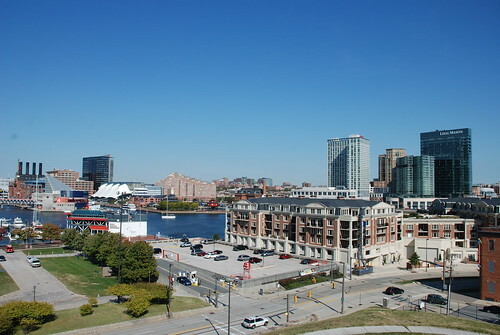 Below are some views of the Inner Harbor from the hill.